For years we have heard rumours about a special box of Cohiba Esplendidos with a see through lid and a humidity device inside it. Admittedly most of these reports came from the other side of the Atlantic, but nevertheless we were intrigued.Inquiries to Habanos SA met with a firm denial that any such box had ever been produced for their flagship brand. So we were delighted when one turned up in London. A taxi driver, who wanted a substantial sum for it, left it with a leading cigar merchant just long enough for us to take a picture, and here it is. The style of the box is a bit rough but not a bad idea. The cigars however are grotesque. If anyone offers you a box like it, tell them it's a total fake! 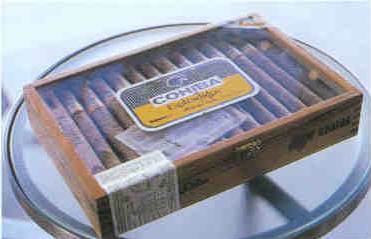 Last year this box of Cohiba Robustos containing just two cigars from its original contents was sent to Havana importers Hunters & Frankau. The owner had received it as a gift from a friend who had been to Havana and he wanted to know if it was genuine. The exterior gave very little away. It was well finished with all the stamps and stickers in place. True the green Cuban Government warranty seal had come off but it was included and this can happen on proper boxes. The only tangible pointer was that the factory stamp was missing from the base but this too has been known on the real thing. So there was nothing conclusive to prove it was fake even if there was cause for suspicion and it would have taken an expert to notice it. On opening the box, the Robusto sticker on the glacine paper than encloses the bundle of cigars was perfect, but underneath the yellow ribbon that wrapped the cigars was totally wrong. It was from a box of Cohiba Siglos and badly printed too. Now the suspicion that it was counterfeit was a virtual certainty but what about the cigars? The owner had given his permission for them to be smoked. The inspectors chose to decline his offer for fear of what they might taste. Instead they took each one apart. One cigar (A above) had a genuine band on it which the other (B above) carried one, which had clearly been run off on a colour photocopier. Ironically the one with the photocopied band (B) was the better-made cigar. As you can see it had long filler leaves, a decent binder and an attractive wrapper. 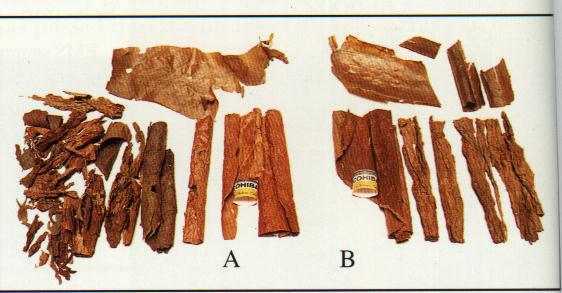 But, all the filler leaves were of exactly the same type with no blend of ligero, seco and volado. It would have s moked all right but it would not have had much taste - and certainly not the Cohiba taste. The other felt like a rock and proved to be chock-a-block with all sorts of bits and pieces of tobacco. Had it been smokeable goodness knows what it woul dhave tasted like, but it wasn't. There are several lessons to be learnt from this episode. First, its very easy to be taken in by fakes. The box looked fine and so did the cigars at first sight. Second, the counterfeiters use many different ways to make their cigars. At least both these cigars were made of tobacco, which is not always the case. And last, no matter how little they charge for cigars like this, you'll do better to stick to the real thing bought from a reputable retailer.